Seen in lobby: Golfers – some who can really play and many who wish they could! WHEN YOU SAY the K Club I think of golf. More specifically, being British and loving golf, I think of the 2006 Ryder Cup, which was held at the K Club, when Britain and Europe thrashed The Americans by a record winning margin to record their 3rd victory in a row in the event. This was the first time the Ryder Cup had been held in Ireland and the crowds poured in to watch history in the making. So, standing on the first tee of the Arnold Palmer course, where the likes of Tiger Woods, Colin Montgomerie, Phil Mickleson and Sergio Garcia had stood a decade earlier (actually they had stood about 100 yards behind me in order to make the hole more of a challenge for them!) gave me goosebumps. It is a lovely course. It is regularly voted one of the world’s top golf courses and along with the Ryder Cup it has hosted 11 European Opens. It is a joy to play. According to the ‘pro tips’ which you can find on the website it rewards an aggressive and precise approach. When I played it I discovered there is a lot of water that comes into play as well as plenty of tricky bunkers! But as we entered the property and drove up to the hotel I wasn’t sure what to expect. The name is intriguing – it doesn’t have one of those grand or distinguished sounding names like Gleneagles or Royal Birkdale – instead it sounds like it could be a mysterious, private rendezvous for the rich and famous. The first glimpse of the hotel is really impressive. Originally modelled on a French Chateau in the 1830s (because original own Hugh Barton loved France), the sparklingly white building is perfectly offset by the rich green Irish landscape that surrounds it. It is classically stylish, with a variety of interesting architectural features that capture your interest straight away, and make you want to explore what it has to offer. And what it has to offer more than meets expectations. It is so much more than a golf course hotel. As you wander through the corridors you are continually wowed by the quality and beauty of the original art works (present owner Michael Smurfit houses some of his private art collection here) and paintings that make you feel you are in an art gallery. Everything you see is always stylish and often quite stunning. When you stay here, make sure you build in time for a leisurely stroll through the hotel to really appreciate the variety of art that is infused into the hotel. Perhaps the best example of this homage to art can be found in the Yeats room, which contains an extraordinary collection of paintings by one of Ireland’s finest painter’s, Jack Yeats (brother of poet W.B. Yeats). Other rooms of interest include two of the bars which have been named after racehorses. 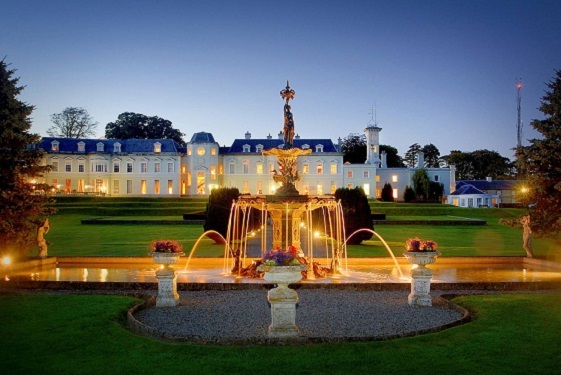 Smurfit is also a racing lover, hence his purchase of a hotel in the heart of Ireland’s thoroughbred racing country, and named the bars after his two Melbourne Cup winners, Vintage Crop (1993) and Media Puzzle (2002). Luckily for visitors to the Kildare Hotel Smurfit is also a lover of fine wines. Take a cellar tour and discover an impressive collection of vintage French wine, including many from B &G (the renowned Bourdeaux winery co-founded by the original owner way back in the 1790s). Afternoon tea in the Chinese lounge with its hand-painted yellow walls is not to be missed. The original building was the famous Straffan House, built in 1832 and developed into a hotel in 1991. Over many years of renovations it has managed to retain its grace, beauty and sense of timelessness. Apart from the golf there is a wide range of activities which includes horse riding, falconry, clay pigeon shooting, archery, fishing, as well as a beautiful spa with indoor swimming pool, gymnasium, sauna & steam room. Most Indulgent Moment: Sitting in the Yeats room, reading an art book about the very artist who adorns the walls. The Little Things: Sheets, bathrobes and towels monogrammed with the K Club crest give a feeling of opulence. Junior Luxies: Welcome and spectacularly well catered (there is a playground in the walled garden).